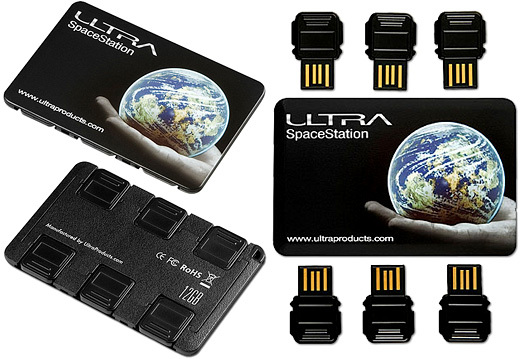 Ultra SpaceStation Packs 6 USB Flash Drives Into Compact Package | OhGizmo! I like things to be in order, and that’s probably why the SpaceStation from Ultra caught my eye. Like most people I have a pile of various sized USB flash drives sitting on my desk that I’ve either purchased or received as promotional items. They do come in handy for transporting large files, but since they’re not labeled I sometimes forget what drive is holding what. To solve this problem the SpaceStation packs 6 individual USB flash drives into a credit card sized package, and includes a set of labels to keep them organized. The flash drives come in either 1GB or 2GB capacities giving you a total of 6GB or 12GB of storage while the included labels cover categories like music, videos, games and work. It’s not a bad idea if you’re a neat freak, but I just wish the storage unit also served as a USB hub allowing you to plug in and access all 6 drives at once. The 12GB version of the SpaceStation runs $89.99 while the 6GB version is $59.99 and both can be purchased directly from the Ultra website. i would so use this for everything- and i would definitely lose some of them. i wonder if you can buy single replacement drives. also, i agree on the usb hub- would be nice to be able to mount/manage all of them at once. It's funny how much the capacity has increased. What seemed like a lot 2 years ago is now standard space. But, it's all about ssd's now!